Early on in his masterful reconstruction of the Egyptian mind set, he tells us that "ancient Egypt is an intellectual and spiritual world that is linked to our own by numerous strands of tradition. You might think the Ancient Egyptians too remote in time to be anything other than intellectual curiosities for us. Jan Assmann, the great German Egyptologist, thinks otherwise. 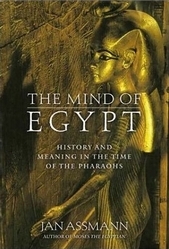 Early on in his masterful reconstruction of the Egyptian mind set, he tells us that "ancient Egypt is an intellectual and spiritual world that is linked to our own by numerous strands of tradition." A brief review can only barely touch on the topics discussed in this book, but I will try to give some examples of Assmann’s conclusions with reference our links to the Ancient Egyptians--they may be more extensive than you might think. Take for example the ancient work "The Admonitions of Ipuwer" from the thirteenth century B.C., (around the time of Ramesses II) which describes "the nobles" as "full of lament" and the "lowly full of joy." Bertolt Brecht was so impressed by this work that, Assmann says, "he worked part of it into the ‘Song of Chaos’ in his play ‘The Caucasian Chalk Circle.’"
Ipuwer was lamenting the overthrow of established order by the lower classes-- so long has the specter of Communism been haunting the world (not just Europe) that Brecht could sense the presence of comrades over three thousand years ago! Brecht made a few slight changes, Assmann says, and the Egyptian sage’s lament became "a triumphal paean to the Revolution."